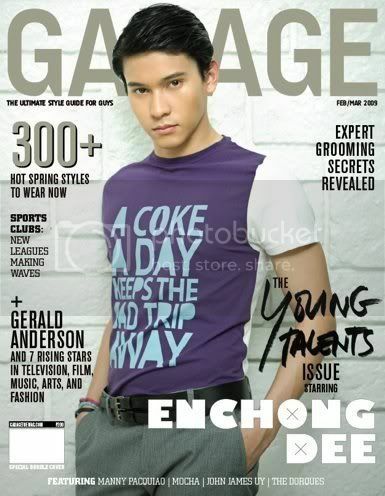 Young kapamilya heartthrobs Gerald Anderson and Enchong Dee are on the back-to-back covers of Garage Magazine February-March 2009 issue. Dubbed as the “Young Talents” issue, Garage selected 7 fast-rising young celebrities from various fields in their feature article spearheaded by Enchong Dee and Gerald Anderson. Also in this double issue is an article about expert grooming secrets, 300+ hot spring styles, sports club and features about Manny Pacquiao, Mocha, John James Uy and The Dorques. Garage Philippines is now available wherever magazines are sold.